This weekend’s MCM London Comic Con event will debut a one-off creation from Triumph, dubbed Venom. The Bonneville-based military-styled bike has been created to celebrate the launch a new computer game Metal Gear Solid V: The Phantom Pain. It’s not the first tie-up between Triumph and the game franchise, with Hinckley bikes appearing in previous versions of the game. 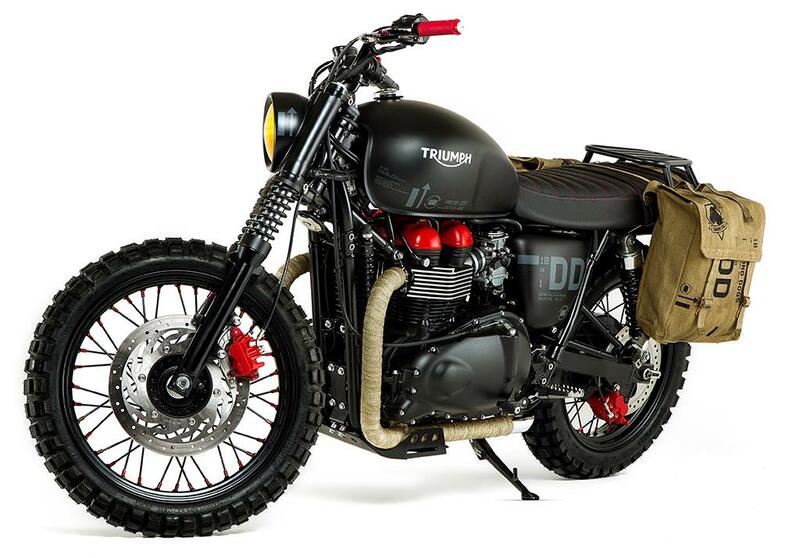 Venom is based on the Bonneville T100 ridden by character Snake in Metal Gear Solid V, and was created in-house by the Triumph team. There are no mirrors, speedo, or rev counter, and it wears aggressive go-anywhere Continental TKC80 tyres, while the stock saddle has been cut down and refinished in Sneaking Suit neoprene and carbon Kevlar leather, inspired by Snake’s combat wear. A heavy duty ammo rack loops around the back of the saddle, offering both protection and somewhere secure to bolt down an extra case or two of rounds. A yellowed-out JVB Rumbler headlight and external heavy-duty fork springs give an aggressive dimension to the front end, exaggerated by the lack of front mudguard. At the rear, the cut-down guard and exclamation mark tail-light add to the individuality of the machine, while colour-coded calipers and cam cover are stand-out details. Venom also gets Tiger off-road footpegs, a Renthal performance sprocket, machined throttle body caps and Triumph sport levers, and stencilled matte black Diamond Dogs livery. Once Venom escapes Comic Con, it will tour a number of other events throughout the year.